A Santa and shooting star display full of lights adorns the outdoor market stalls at Christmas in the Romerplatz in Hessen, Germany as buildings of unique architecture adorn the backdrop. The Christmas markets in the Romerplatz in Frankfurt, Hessen in Germany is always decorated with hundreds of outdoor Christmas lights. Each outdoor display may be simple, while others are quite extravagant, but all the lights add to the final picture that glows around the Romerplatz during the festive season.Christmas markets in the Romerplatz, Frankfurt, Hessen, Germany, Europe. 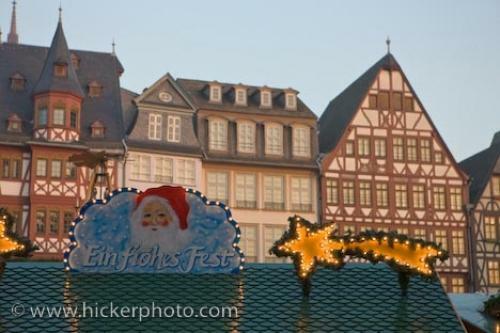 Photo of the outdoor Christmas lights displayed at the Christmas markets in the Romerplatz in Frankfurt, Hessen in Germany.